So tell me. How do you save recipes you love. Do you rely on Pinterest or do you have a cute file like this one from Etsy? 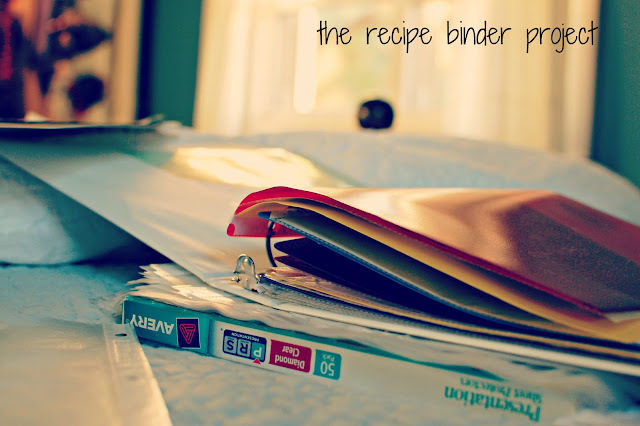 For whatever reason I've been all about the binder. Pretty classic with it's 3 rings and laminated pages. It's easy to pull what I want out and know that whatever splatters won't ruin the pages. Unfortunately for me though I have a stack of recipes that need to go into the binder and even more magazines yet to be read. Think of all the recipes in these babies? Especially since most of them are Cook's so you know they're real winners. I'd love to know how you store your recipes. What's been the best method? 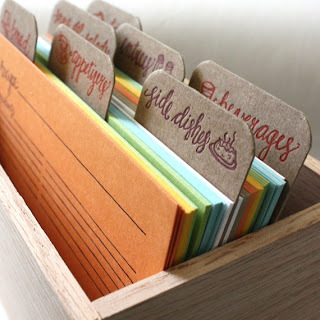 There is something special about recipe cards whether it's writing down a favorite dish for a friend or referring to your Grandmother's apple crumble on a card she wrote many years ago. That said, if I had them all on cards it would take me a long time to sift through everything I've made. Then again, that's what this blog is for, right? I've started just keeping my classics on cards in the kitchen so I know the temperature and ingredients for items we make often, like company crusted pork tenderloin, pizza dough, or risotto. I was looking at a way to keep recipes recently, too. Right now I have a book but it's pre-bound and I've run out of recipe pages. So..now what? I want something laminated and I'm sorta on the card idea right now. Yah, I think the laminated sheets seem to be the easiest- easy to tear out recipes I find in magazines or even print from online and just throw them in the sheets!